Luke Jerram presents ‘Withdrawn’: Are We Abandoning Mother Earth? Visitors to Leigh Woods in Bristol may be surprised to encounter a flotilla of ‘abandoned’ fishing boats installed in the depths of the woodland. Withdrawn is an ambitious new installation by celebrated artist Luke Jerram commissioned by the National Trust working with their partners, the Forestry Commission. This thought-provoking installation raises discussion about climate change, extreme weather, falling fish stocks and our impact on the marine environment. Miles from the sea, how did the boats get here? Were they left by a receding tidal surge or a changing coast line? Or is this the effect of overfishing which has caused fish stocks to collapse alongside the industry? The result of conversations with fishermen, scientists, and specialists in marine life, Withdrawn uses art to encourage us to reflect upon the impact humanity is having on our seas. Whether this is through commercial exploitation in overfishing, or climate change and pollution, the future of our complex environment is uncertain. 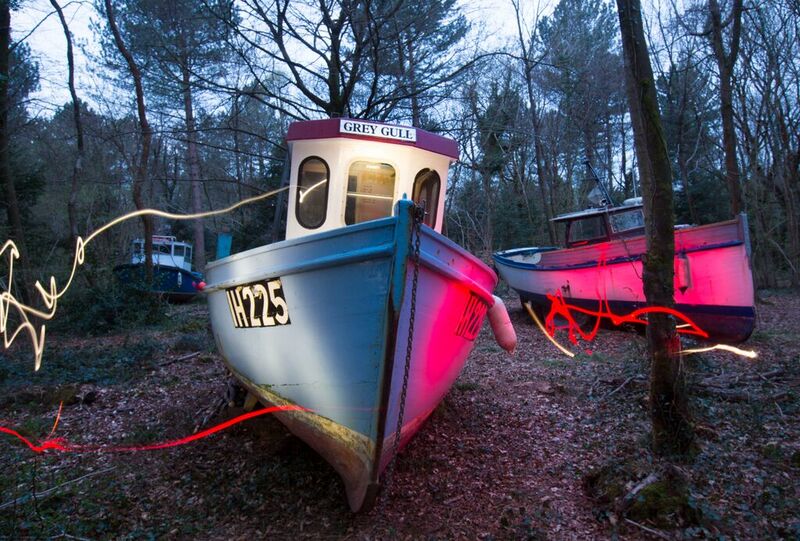 A beautiful, surreal and poetic vision in the woods, all of the boats face the same way as if turned by the tide. Their names – ‘Gloria Jean’, ‘Joanne Marie’, ‘Martha’, ‘Seahorse’ and ‘Grey Gull’ – are intended to conjure up the personalities of previous owners. Ruth Gooding, Contemporary Arts Programme Manager for the National Trust’s Trust New Art Bristol explains, We are delighted to work with Luke to create this thought-provoking installation for Leigh Woods – a beautiful environment that we care for in partnership with the Forestry Commission. We know how important this special woodland is, and we hope that visitors will enjoy discovering all the different trees, plants and wildlife as they make their way towards Withdrawn. The work is enchanting but also unsettling, a paradox which makes a clear message – our natural environment is under threat and we need to re-evaluate the balance between ourselves and our natural resources. The programme of events opens this conversation – it is both a celebration of our seas and oceans and a forum to start exploring what a more sustainable future might look like. Jerram explains, I wanted to raise awareness around the decline of the fishing industry in the South West. For several decades, unsustainable fishing practices, have caused fish stocks of many species to collapse. With less fish in the sea, it’s often not financially viable to use a small fishing vessel to fish with. Withdrawn is also a response to the extreme weather and apocalyptic imagery we’ve seen in the media recently – the floods on the Somerset Levels last winter and further afield, Hurricane Katrina and the tsunami in Japan, where cars were floating down streets and houses submerged in water. The positioning of these boats in Leigh Woods presents a similarly uncanny scenario that reminds us of a possible future if we don’t address climate change now. The installation can be discovered through a walk in Leigh Woods or visitors can attend one of the series of events taking place throughout the summer from choral performances, theatre, lectures, live film events and night-time cycle rides. The events programme will culminate on 23rd August with a talk by the University of Bristol, Cabot Institute, which will explore the challenges of environmental change. After Nyne caught up with Luke to discuss Withdrawn and what it’s like creating installations for people to participate in. What inspires you to create large scale pieces for a wider audience to participate in? I’m interested in making artwork outisde of the gallery and museum system. I like reaching audiences that wouldnt ordinarily visit these places.Â Park and Slide, Sky Orchestra and Play Me I’m Yours are examples of large scale work that become activated and only really exist when an audience interacts with them.Â My latest work WithdrawnÂ is both an installation for the public to explore as well as a venue for events. So its related, but different to these previous works. When did you first begin development work that involved audience participation? What would you say has been your most successful large scale art installation? Play Me I’m Yours. With 1400 pianos installed in more than 48 cities world wide, we’ve reached more than 8 million people. Several couples have met for the first time at a piano and got married as a consequence of the art project. The installation has also been copied by many cities so now, its completely normal to see a piano for the public to play, out on the streets.Â Though campaigning for a change in the law, you now no longer need a music licence to put a piano on the street in the UK. In these ways, we’ve literally changed the culture. Leigh Woods is a beautiful environment for the installation but there must have been difficulties when putting large boats in the scenery. What challenges did you have to overcome when installing Withdrawn? There were all types of challenges. Financial, political and practical! In the end we were helped by an army of squirrels from Leigh Woods who helped drag the boats in! What are the main concepts influencing the development of Withdrawn? This installation is designed for the public to stumble upon and explore in the woodland.Â Withdrawn is commissioned by the National Trust working with their partners, the Forestry Commission so the main concept is rooted in our environment and to raise awareness around the decline of the fishing industry in the South West. It’s also a response to the extreme weather and apocalyptic imagery we’ve seen in the media recently. The names of the boats are meant to conjure up ideas of previous owners personalities. Did you develop each boat with a specific character in mind? Each boat has its own character, but they were more or less found this way full off the old kit left by the previous owners.. Compasses, fishing gear, maps, dust and cobwebs. I wanted a range of boats, of different sizes. I bought the smallest boat, Martha, to allow children to climb on board and pretend to be out a sea. Withdrawn undoubtedly raises awareness of changes to the environment. In which ways do you hope the installation will help it’s audience alter their thinking in terms of the environment? For me, the artwork is an additional voice in the ongoing discussion about climate change and the importance of the ocean. The positioning of these boats in Leigh Woods presents an uncanny scenario that reminds us of a possible future if we don’t address climate change right now. What influence has Withdrawn had on your current art practise and how may it effect upcoming projects? It’s hard to predict the impact of this project on my new work. I’m currently working on more than 20 projects with organisations around the globe.Â I suppose Withdrawn has given me belief that I have what it takes, to build and steer a teams to deliver large scale ambitious projects with multiple partners. Withdrawn was commissioned by the National Trust, working in partnership with Arts Council England. It is one of six arts projects funded by the Arts Council England, Exceptional Fund, as part of Bristol’s year as European Green Capital. Getting there Visitors are invited to walk, bus or cycle to the site in keeping with the environmental message of the project. Withdrawn is well signposted on entry into Leigh Woods. Maps can be downloaded on www.trustnewartbristol.org in advance of visiting. Posted in art and tagged after nyne, after nyne magazine, art, art commentary, art exhibitions, boats, commisions, environmental art, installations, leigh woods, national trust. Bookmark the permalink.